March 31, 2019 Update: US consumer price index increased +1.5% in the past 12 months, while the real national GDP rose an estimated +2.2%. Year-over-year, Materials, Energy, Real Estate, and Consumer Discretionary sectors are in decline. Healthcare is the only industry that is expected to grow in 2019. Traditional brick and mortar companies are still the largest US employers. Thirteen percent of US companies don`t make enough money to cover their expenses. This number increased by +1% since 2016. The new number of claims decreased by 5,000 to 211,000 mostly due to job gains in OK and PA. The four-week moving average increased by 3,250 to 217,250. Insured unemployment increased by 13,000 to reach 1.76 million. Latest April 2019 news regarding the extension. For those who were not certifying for federal extension benefits due to going back to work, school or other situation but still had a remaining balance left on a federal extension claim, they have to reopen their claim if they are in need of extended benefits. The EDD recommends submitting a claims online to reopen their extension claims. Reported in April of 2019, 196,000 new jobs were created in March of 2019. The unemployment rate remains unchanged at 3.8% with a total of 6.2 million unemployed (down 24,000). March`s unemployment rate among population segments were as follows: for Asians 3.1% (flat), Whites 3.4% (up 0.1%), adult women 3.3% (down 0.1%), adult men 3.6% (up 0.1%), Hispanics 4.7% (up 0.4%), African Americans 6.7% (down 0.3% in March and down 0.1% since March of 2018), and teenagers at 12.8% (down 0.6% in March and no change in the past 12 months). Non-farm, seasonally adjusted employment decreased by -201,000 (+255,000 in February) to reach 156,7 million. The number of long-term unemployed increased to 1.3 million (up 34,000) in March or 21.0% of all unemployed (up 0.6%). The unemployment rate in March decreased for short-term unemployed and increased for other categories. The Real National Unemployment Rate has not changed in March and is currently at 7.0%. 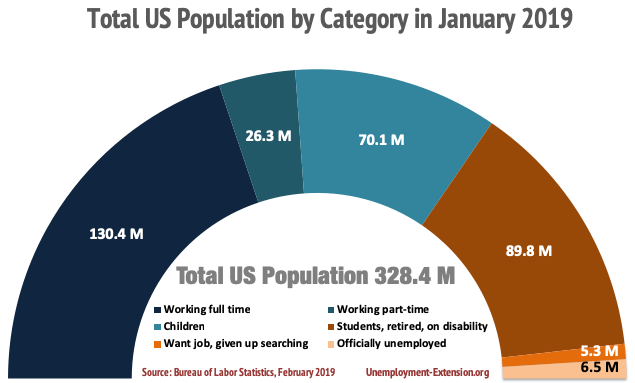 There are currently 5.2 million (up 5,000 in March) individuals who want a job but are not considered unemployed and for this reason, are excluded from the official unemployment figures. Employment Metrics Most of the employment metrics somewhat improved since April 2018. Fed boosted interest rates 4 times in 2018 from 1.5% to 2.50% but has lowered forecast for this year. The US Prime Rate is now 5.5%. Economists foresee a minor economic slowdown in 2019. Most of the month-over-month job gains took place in Healthcare +70,000, Professional Services +37,000, and Hospitality +33,000 offset by losses in Retail -12,000 and Manufacturing -6,000 industries. In the past 12 months, Healthcare added +572,000 new jobs, Professional services +533,000, Hospitality +431,000, Construction +283,000, Transportation +256,000, Government +195,000, and Manufacturing +191,000, while Retail lost -132,000 and Wholesale -45,000 jobs since March of 2018. All industries and sectors average hourly earnings increased by 4 cents in March of 2019 (+3.2% up since March of 2018). Labor Force Participation Rate in March of 2019 decreased to 63.0% or 3.2% below what it was in January of 2008 - the highest pre-recession employment level of 66.2%. 1.2 million of the high-paying US manufacturing jobs have been lost from the economy since 2007 (12.8 million in January of 2019 vs. 14.0 million in January of 2007), and instead, have been replaced by considerably lower-paying service jobs. This situation has improved in the past year as Manufacturing added +191,000 new jobs. Manufacturing added +1.39 million jobs since historically lowest of 11.5 million in Mar 2010. Although, Manufacturing lost -21,000 jobs since Dec 2018. In-Focus Retail industry lost -132,000 and Wholesale -45,000 jobs since March of 2018. Information jobs increased by +56,000. New highly paying Machine Learning (AI) and Data Science industries have hard times establishing a sizable footing in the US. Instead, the funding and employment opportunities keep on moving directly to China and India. China has announced a plan to dominate the AI industry by 2030. Outsourcing of High-Tech jobs destroys any hopes for US middle-class upward mobility. The long-term unemployed 1,305 (up by +34,000 in March and +19,000 in February) - out of work for 27 consecutive weeks or longer. Despite the full employment in many states, this group finds it extremely challenging to get employment, as employers perceive their skills as outdated. Currently, the US government contemplates developing skill-upgrade programs. Teenagers (16-19 years old) are still the most jobless population group with the highest unemployment rate of 12.8% (down -0.6% in March, up +0.5% in February, up +0.4% in January and down -0.6% in the past 12 months) and the lengthiest unemployment across all races, genders and age groups. The US government started offering a loan repayment program that can take care of student loans of up to $75,000. Changes in long-term unemployment in April of 2019: long-term unemployment (27 weeks and over) increased by +34,000 in March of 2019; mid-term (5-26 weeks) increased by +13,000; short-term (less than 5 weeks) decreased by -68,000. Over the past year, the number of long-term unemployed declined by -17,000 and represents 21.0% (up 0.6% since February) of all unemployed. Regretfully, many of these individuals ran out of benefits and consequently reclassified as not in labor force and get gradually replaced by those in the mid-term group. Opioid and Long-Term Disability (LTD) are among the main contributing factors. The number of not in labor force increased by 242,000 in the past 12 months. Latest studies revealed that publicly funded trade schools are one of the most effective methods of bringing unemployed back to the labor force. Millions of adult Americans are still unable to find a meaningful full-time job, have given up looking for one or accepted unemployment as a status quo. This large group of adults represents a unique economic and political opportunity. It is our goal to leverage their skill and talent to produce economic benefits. Unemployment rates were lower in May in 14 states and stable in 36 states and the District of Columbia, the U.S. Bureau of Labor Statistics reported today. Eleven states had jobless rate decreases from a year earlier and 39 states and the District had little or no change. The national unemployment rate edged down from April to 3.8 percent and was 0.5 percentage point lower than in May 2017. 9 US states had their unemployment rates decreased, 3 states experienced increases, and 38 states remained unchanged. Unemployment rate in 10 states decreased from a year earlier, while 40 states experienced no change. The national unemployment rate increased to 4.0% (up 0.2%) from May, but 0.3% lower than in June of 2017. In June of 2018, employment rose in 5 states, decreased in 1 state, and remained unchanged in 44 states. Over the year, 32 states added nonfarm payroll jobs and 18 states and DC were essentially flat. In June of 2018, Hawaii has the lowest unemployment rate of 2.1%. Oregon`s rate of 4.0% is at historical lowest since 1976. Alaska has the highest unemployment rate of 7.1%. 16 states have their rates lower than the US value of 4.0%, 6 states have higher rates, and 28 states have rates at a national level. 9 states experienced decrease in unemployment rates, with the largest decreases of 0.2% in New Mexico, Pennsylvania, and South Carolina. 3 states experienced rate increases: Ohio (up +0.2%), Louisiana (up +0.1%) and Maine (up +0.1%). The remaining 38 states experienced no change in unemployment rate. Unemployment rate changes from June of 2017: decrease in 10 states, including NM (down -1.2%), followed by KY (-0.9%). In June 2018, 5 states had over-the-month increases in nonfarm payroll employment with the largest increases in MA (up +21,400), IL (up +18,100), and GA (up +14,200). Percentage-wise, the most significant improvement took place in MA (up +0.6%), TN (up +0.4%) and GA, IL, and NC (up +0.3%). WV lost jobs since May (down -8,000, or -1.1%). Thirty-two of all states experienced increases in employment in June. The largest job gains took place in TX (up +359,500), CA (up +269,100), and FL (up +170,500). Percentage-wise, the largest gains took place in ID and UT (up +3.0%), followed by TX (up +2.9%). October 15, 2014: Will the Unemployment Extension be renewed in 2014? Here’s why Obama and Boehner blame both the unemployed as well as lengthy Congressional recesses for missing the Unemployment Extension bill. Continue reading to find out. October 8, 2014: Some call them “the lost generation”. Many believe their "wage scars" will last upwards of twenty years and they will never be able to retire. It is estimated that federal and state governments are losing approximately $8.9 billion in revenue each year because of them. They tear at the very fabric of American society. Continue reading to find out if you are one of them. August 8, 2014: The portion of Americans between the ages of 25 and 34 who were working in April fell to a five-month low of 75.5%. Read More: Recent College Grads & Unemployment: How Many Graduates Can Actually Find Jobs? July 7, 2014: Federal Funding Available for College Course. Pell Grants Give Up to $5,500 for Training. June 20, 2014: Unemployment Offers Opportunities for New Jobs Training. May 27, 2014: Unemployment Drops as Lawmakers Debate Benefits Extension. Federal tiers are determined by the state`s unemployment rate where the unemployed individual chooses to file for benefits. US employment is 113,000 jobs short of its highest figure in Jan 2008. Do you feel that the economy is back to normal? Share with us your opinion. Benefit Extension: Your eligibility and the total amount of weeks for compensation are the major changes in the 2012 legislation bill. Congress has permitted States to administer drug testing for unemployed individuals seeking an extension of benefits if they were previously laid off due to the use of drugs. In order to obtain the full 73 weeks of State compensation update, most states still require an active job search, as was the case in 2012. State requirements of unemployment will vary, relying heavily on the seasonally adjusted unemployment rate. *Individuals who have collected all regular State benefits are those who can seek eligibility for the new unemployment bill, by starting with 13 weeks of federal extended benefits, referred to as extended Federal benefits or the "EB" Program. The EB Program is also relies on the state`s economic status to determine lengths & amounts. Check the update page for legislation revisions throughout 2013. After utilizing your Extended Benefits for 13 weeks, unemployed individuals can continue receiving benefits through the EUC (More on Emergency Unemployment Compensation). 2013 Extended benefit lengths are determined by which tier the individual falls into. The new Senate bill of December 2012 is comprised of 4 separate EUC tiers (each tier defines how long your extension will last). 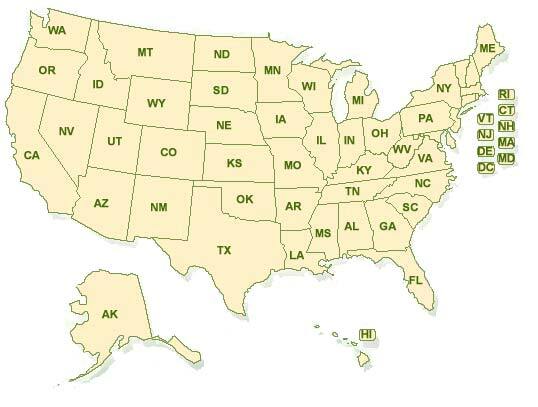 Tier 4: 10 weeks (when your State is 9% or higher - if your State is losing extended benefits, then you are entitled to 16 weeks of unemployment insurance. Depending on the date you lost your job, you may qualify for a different tier structure. Tier 2: 14 weeks IF state rate passes 6%. Tier 3: 13 weeks IF state rate passes 7%. Tier 3: 9 weeks IF state rate passes 7%. Unemployed individuals are welcome to check the news update section for the latest legislation revisions to all State benefit plans.